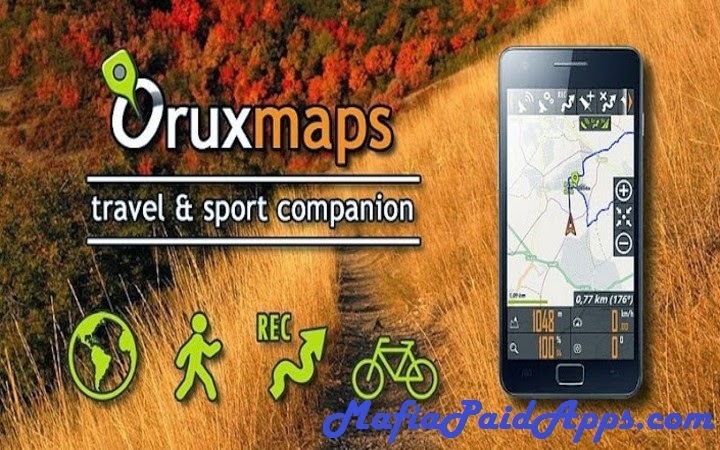 -OruxMaps format. You can use maps from Ozi Explorer transformed wit a PC tool. -.img garmin (vectorial) -no full support is provided-. -.map (vectorial from mapsforge). Support to custom themes similat than Locus themes. Support to Wms, you can use the application as a WMS viewer. -Heart rate monitors, bluetooth Zephyr, Polar (including bluettoh smart devices, like polar H7). -ANT+ (speed, cadence, heart rate, distance,...). -AIS information systems (experimental), for nautical sports, using Wifi o BT. Support to KML KMZ and GPX formats. Share your position with your friends, display the position of your friends in your device. Download online maps for offline use. Profiles; save your preferences in your SD card. Follow routes, with different alarms to alert you if you are near a waypoint, or you are far from the route. Create/save wayponits, attaching photo/audio/video extensions. Custom waypoints types, with your icons. Correct the altitude of your tracks/routes using DEM files (offline) or online services. Search or create tracks using online services from Cloudmade or offline using Broute app. —>Bug correction with mapsforge maps, sorry. —>Added a map to the wear app. —>Voice control using wear app. —>Bug correction (CRASH WHEN ZOOMING (motorola, bq) ->SETTINGS--MAP--ZOOM SETTINGS).